The chanterelle is a nice forest mushroom with pleasant taste and nourishing qualities. However, according to Dian Nan Ben Cao ("Yunnan Materia Medica") 《滇南本草》, written by Lan Mao 兰茂 in 1436, the chanterelle has damp properties and that's why it is important to be cooked with ginger to counteract the dampness. "The common people mostly boil [chanterelle] with garlic, thinking that if there is a poison, the garlic will turn black; they don't know that if there is a poison in the mushroom, the garlic not necessarily will blacken. But when ginger encounters the poison, it will surely turn black". Gazing at the stars makes us feel overwhelmed by the beauty and vastness of the sky. Look these several nights for the wonderful trio - Moon, Mars and Spica - gathered together and spreading their light towards all of us! Spica (角宿一 in Chinese) is the brightest star of Virgo. In Chinese astronomy it is the major star of Horn constellation 角宿, located at the horn of the Azure Dragon in the East. 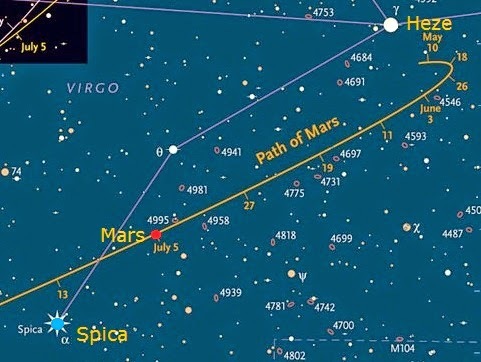 If you make a line connecting Spica (α Virginis) and Heze ( ζ Virginis), then you will have the "Gate of Heaven" 天门, through which pass the ecliptic and the planets of the solar system. It was just two days ago that the Daoist temples throughout East Asia celebrated the Opening of the Gate of Heaven day 天門開日. Now, these days it's time for Mars to pass through the Gate of Heaven. Enjoy the view!